On March 22, a launch party like no other will be held at Union Sound Hall. 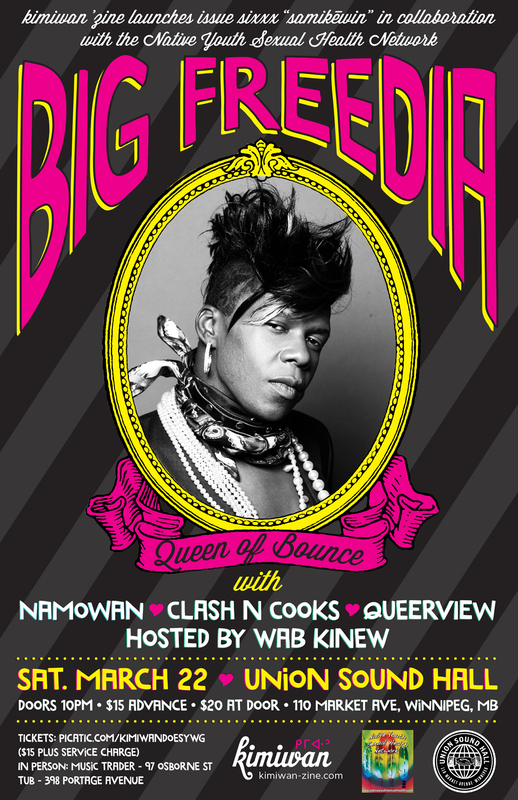 Hosted by Wab Kinew and featuring New Orleans’ own Big Freedia, the party is in celebration of kimiwan ’zine’s issue sixxx. The kimiwan ’zine’s collective spoke with the Manitoban about the history of the ’zine and their hopes for the event. The Manitoban: Why do you believe that it’s important to bring the written word and visual art together in this ’zine? Kimiwan ‘zine: Kimiwan ’zine was created because we wanted to see something in our community that didn’t exist. We came together, and continue to work together, because we believe that art should be accessible, and reflective of community. M: Which ’zines or other publications do you draw inspiration from for kimiwan ’zine? KZ: Kimiwan ’zine was founded by Joi. T. Arcand. Several years ago, while Joi was living in Vancouver, she became involved in the RAIN (radical art in nature) zine. “Zines are a great way to take art out of the gallery and into people’s homes and into the streets,” says Arcand. When she returned home to Saskatchewan, Joi created kimiwan ’zine (which translates as simply “rain” in the nehiyawewin or Plains Cree language) with her cousin Mika Lafond. The collective that currently creates the ’zine is comprised of Joi T. Arcand, Leah Arcand, Jarita Greyeyes, and Melody Wood. M: Many of your past launches were held in Saskatoon (Treaty 6 territory). What inspired the decision to launch this issue in Winnipeg (Treaty 1 territory)? KZ: Winnipeg is home to the largest urban indigenous population in Canada, and the weekend of March 21-23 [ . . . ] is full of exciting events drawing a national crowd to the city. Friday, March 21 is the opening of the Walking with Our Sisters exhibit at the Urban Shaman gallery, and the Indspire Awards is being held that evening as well. Our cover artist for issue sixxx is Kent Monkman who will be recognized by Indspire for his contributions to the arts. We wanted to bring the ’zine to a vibrant city that has a strong indigenous and arts community. In the fall of 2013 we held an event in Vancouver, and are looking forward to bringing kimiwan ’zine productions to other cities across North America in the upcoming year. M: Is there currently anywhere in Winnipeg to check out kimiwan ’zine? KZ: [We also] travel to other cities to develop relationships with potential supporters of kimiwan. In addition to the launch event at Union Sound Hall, we will also be having a pop-up ’zine shop at Neechi Niche (inside Neechi Commons) [ . . . ] from 11:30 a.m. to 1:30 p.m. on March 21. If you can’t make it to either event, we will update www.kimiwan-zine.com with places to purchase the ’zine in Winnipeg. M: How far-reaching are the submissions for the ’zine? KZ: The majority of our submissions come from Canada and the United States but we have had submissions that come from around the world, including Hawaii and New Zealand. It’s an amazing feeling knowing that people across the globe want to contribute to what we are building. M: How did the partnership with the Native Youth Sexual Health Network come about for this issue? KZ: Our sixth issue titled “samikēwin” (touch) is a collaboration with the Native Youth Sexual Health Network (NYSHN). [The Native Youth Sexual Health Network] strongly supports media and arts justice initiatives that provide creative spaces for indigenous communities to tell stories about our bodies and the spaces they are in. We have deep respect for the work that NYSHN undertakes, particularly as they have a dedicated arts justice program and often have art workshops on sexual health [ . . . ] Artwork is a catalyst for drawing connections between issues that might seem unrelated on the surface. We partnered with them as it’s a natural fit in terms of arts and sexual health, which is exactly what our issue sixxx—samikēwin—tackles. M: Your issue five/one-year anniversary launch party looked like a big, awesome party. Are you hoping to keep that momentum going with this event? KZ: As an unfunded and volunteer-driven organization, we rely upon community support to continue to produce the ’zine. Events serve a dual purpose; they allows us to bring together performance artists that we love, while raising funds to continue to create future issues. In February we had an incredible event that brought together a diverse group of people for an evening of music and dancing. As we gear up for our Winnipeg launch party, we certainly want to keep the momentum going forward [ . . . ] It is our hope that people associate kimiwan ’zine with energetic events with world-class talent that shines a light on the work we are doing. M: Can you tell me a bit about how kimiwan connected with Big Freedia, and about your vision for this event? KZ: Since issue sixxx is focused on our sexual and gender identities, Big Freedia, who is an incredibly talented performer (and also happens to be transgender), would be a great fit. Plus, we love bounce music, and have been practising our twerking! It is really important that when we go to a new territory that we are welcomed by the people from that place. We are thankful that Wab Kinew is going to be our host for the event. Wab is committed to the community, and we are happy to have his support. M: Will you all be making the trip here for the big event as well? KZ: We are very excited that the four of us are all heading to Winnipeg, and will all be in attendance at the lunch event on Saturday, March 22. One of our members, Jarita, is an [alumna] of the University of Winnipeg and spent many years in Winnipeg. “I’m excited to return to Winnipeg to share the work that we have done with kimiwan ’zine. We have received so much support and encouragement for the launch and can’t wait to share issue sixxx with a city that definitely knows how to keep warm on the coldest winter nights,” says Jarita. 1 Comment on "Out of the gallery, into homes and streets"
this looks amasing, wow, inspiriing. am an artist and am grateful for your hard work and teachings.